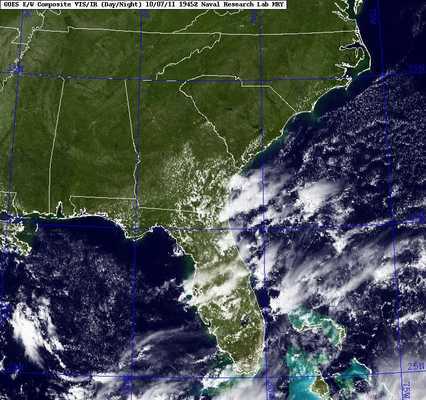 Even though the calendar says October 7, the tropics are starting to look more like August or September! The East Pacific basin currently has two tropical systems (Irwin and Jova), both of which are forecasted by various models to impact Mexico, just south of the Baja. That could help to spread more rain into TX in the next week. Meanwhile, a strong trough of low pressure over the Rockies with a digging shortwave analyzed in the GOES-Sounder RGB Airmass product below will help draw copious amounts of moisture northward into the Central Plains drought areas over the weekend. The red areas in the image show the digging shortwave (or energy) which will cutoff and allow the warm moist air (greens) to be drawn out of the Gulf and into northern TX, OK, and KS. The GOES-Sounder RGB Airmass product valid at 12z (8 a.m. EDT) on 10/07/11. The yellow lines are the 12z NAM 500 mb initializations and the white lines are the 12z GFS 500 mb initializations. In the meantime, we have some excitement forming around FL over the next 3 days. All of the reliable models are developing low pressure around FL and moving it up towards the Mid-Atlantic by mid-week next week. The question remains. . .will it be tropical or subtropical? I don’t have an answer on that one yet, but if the system forms over the Bahamas as indicated by the GFS, CMC, and NOGAPS, then it could be tropical and rather potent at that. If it develops over the Eastern Gulf as indicated by the European model, it would most likely remain a hybrid, subtropical system. 12z GFS surface plot with precipitation amounts valid at 72 hours (Monday morning). 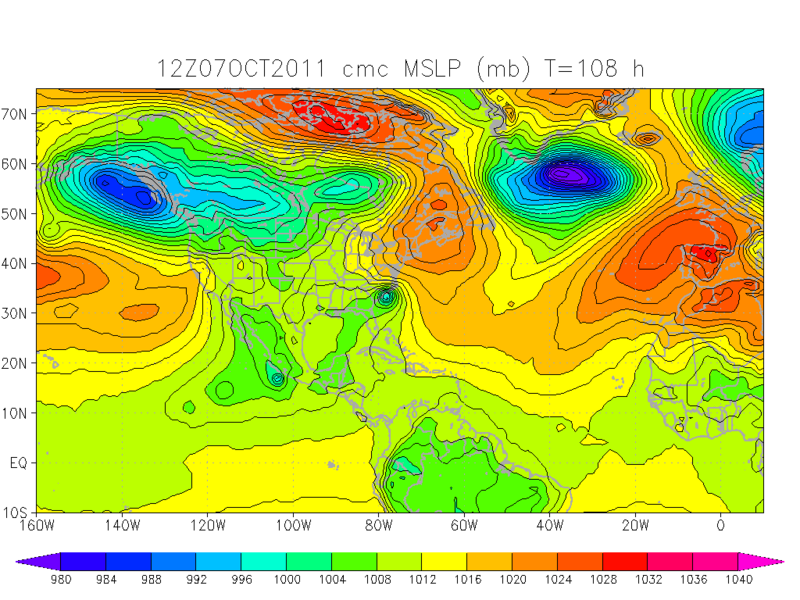 12z CMC sea level pressure valid at 108 hours or Tuesday afternoon. As you can see in the above two model images, the placement and timing of this storm is still up in the air. The GFS is faster than most models and the CMC is starting to lag behind. I would expect a wet, windy weekend in FL with that slowly spreading up the coast heading into next week. The satellite image below shows our starting point. . .we have a long way to go before a classified storm is in this area. If I haven’t mentioned your area, the weather looks pleasant through the weekend with moderating temperatures for most. The exception will be the Pacific Northwest with increasing precipitation chances.